I didn’t plan to, but I wrote an interpretive program for my wedding. For a day that involved military background checks, milkshakes, trivia competitions and a surprise pinata, it just seemed like a good idea. 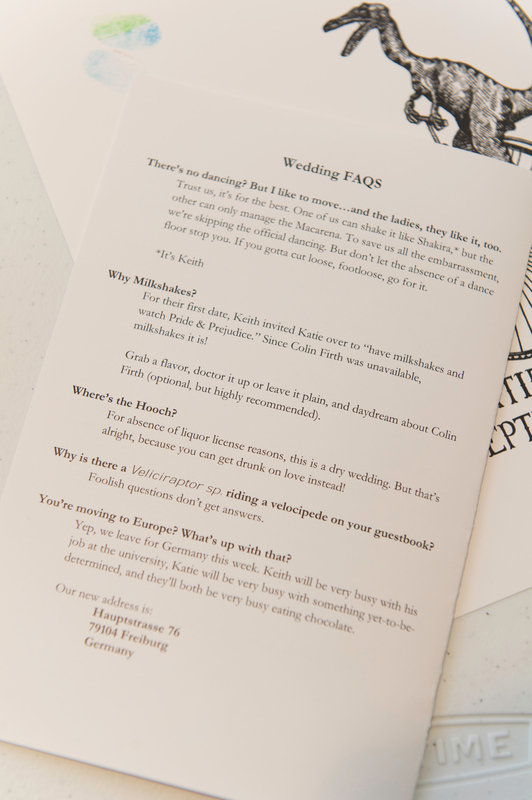 While most people know what to expect at a wedding, our was just different enough that guidelines and cues to let our guests know what was going on and how to participate made sense. 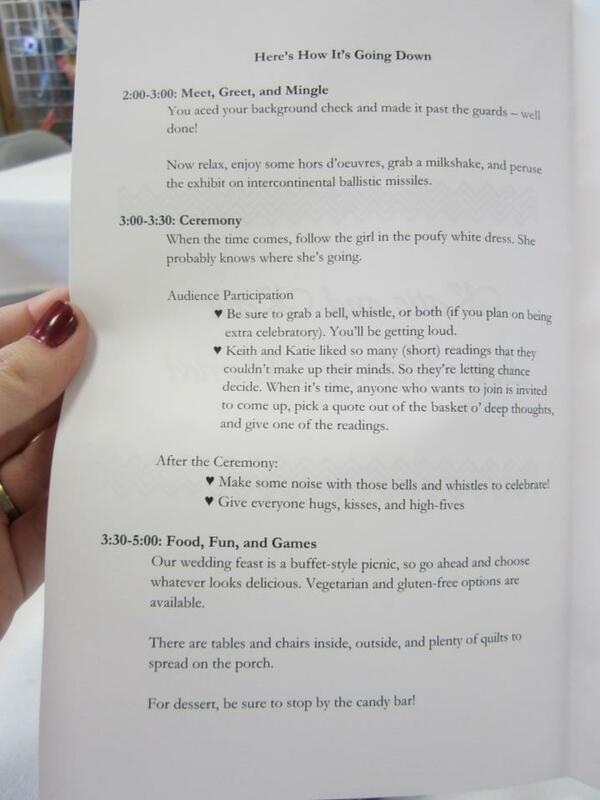 But instead of a traditional wedding program, ours included Shakira, Colin Firth, and a velociraptor. Out of all the great comments we’ve had from guests (the pinata was a BIG hit), I was surprised at how many people told us they loved our program. We were told it was fun, informative, clever, clear, and answered the questions they had about our somewhat non-conventional celebration (and these weren’t even museum people!). Our guests reactions to the tools we gave them reinforced again what I’ve known for a long time: the presentation of information doesn’t need to be boring. I’ve always suspected one of the reasons most visitors don’t read labels is because the copy can be so dry. Happily, interpretive approaches are changing but I still see far more pedagogic, synoptic, and from-the-book text than needs to exist. Make it clever, compelling, interesting, inquisitive, silly, sarcastic – make it something. You’re telling a story that matters, and the words you choose matter, too. Not every occasion will call for Colin Firth,* but you might be surprised at the difference creative text makes. 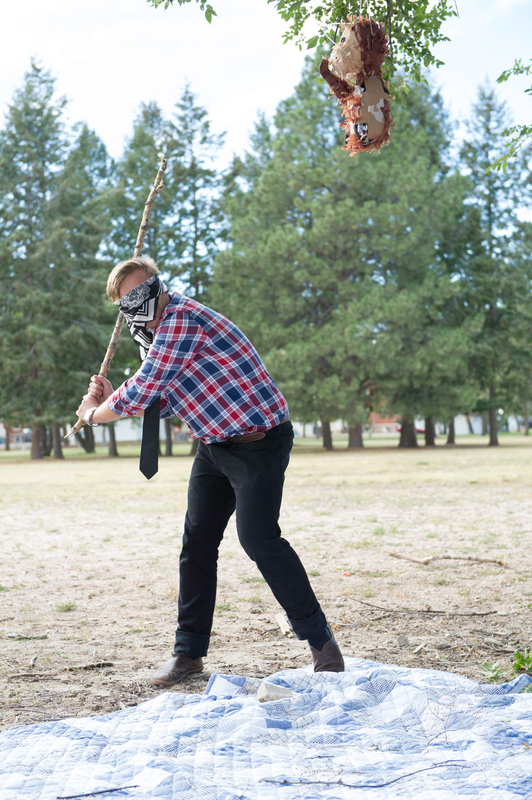 The pinata, only suffering some minor flesh wounds. *Who am I kidding? What occasion doesn’t call for Colin Firth?